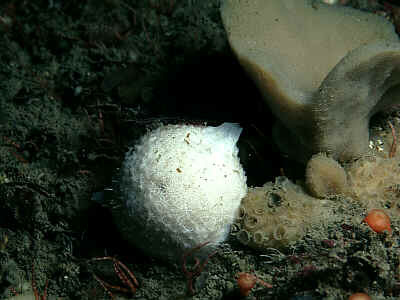 Description: This is a very distinctive spherical sponge, varying in size from a large pea to a golf ball. It is a frequent species in deep water but rarely found in depths which divers can reach. The surface is conulose and there is usually one oscule with a raised rim. Habitat: Usually below 40m depth on open coasts and offshore. 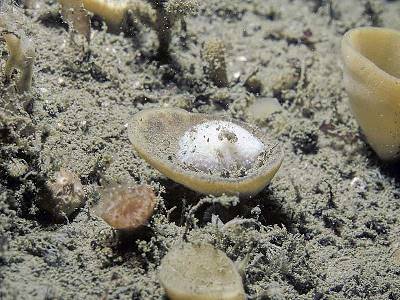 Ecology: Often found inside cup shaped sponges, Axinella infundibuliformis and Phakellia ventilabrum. Distribution: Shetland, Galway, Kerry Head shoals. Similar Species: Two other spherical species of Tetilla are reported from the area, Tetilla cranium and Tetilla infrequens. The common species Tethya citrina is similar in shape but yellow in colour. Picton, B.E. & Morrow, C.C. (2016). Craniella zetlandica (Carter, 1872). [In] Encyclopedia of Marine Life of Britain and Ireland.